In life, sport and in business, rich rewards are born of risk. So, rather than play it safe and sticking with ‘sure things’, New Zealand Bloodstock (NZB) has put its money on the line, betting that a new way of horse trading will hit the nail on the head with its clients and prove a winning formula in the high stakes game of horse trading. Just as the internet changed the way we bet on horses, it’s now set to change the way we buy. 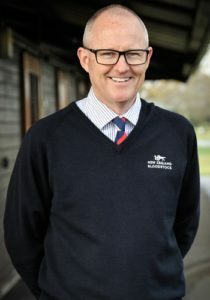 Andrew Seabrook (NZB’s managing director and director of Auckland Racing Club) asserts that Gavelhouse.com is on course to change the way the bloodstock industry operates here and abroad through its fortnightly online bloodstock auctions. “We’ve sold horses valued at up to $138,000, quite a few for over $100,000, and in our first seven sales we turned over about $1.5 million. Our clearance rates are improving too, so we’re bloody pleased with how it’s going,” he says. ‘Real world’ sales continue, as evidenced by the recent National Yearling Sales (Jan 30 – Feb 5) at NZB’s Karaka Sales Centre in southern Auckland, which again saw big money buyers whipping out their chequebooks. However, Andrew believes Gavelhouse.com offers a more cost effective option to buyers and sellers of lower priced bloodstock, such as untried horses, foals, brood mares, weanlings, or even stallion shares and services. “It’s expensive for us to run a sale, and it’s expensive (when you consider such factors as transport costs, travel and accommodation for staff) for many to come up from the South Island, or elsewhere in the world, to buy or sell. This way, they don’t have to. Purchases through the site don’t need to be made ‘sight unseen’. Andrew confirms that photos, videos, vet reports and other information can be provided and buyers can still arrange viewings without horses needing to leave their home paddocks. Despite Gavelhouse.com focusing on the middle to lower end of the market, Andrew concedes that it could well take food from NZB’s trough, in a manner of speaking. Andrew is betting that an overall increase in the number of lots should more than offset any reduction in business NZB could experience with its traditional sales. In addition to attracting more buyers and sellers – those who wouldn’t usually travel to Karaka – the Kiwi company expects to net business across the ditch as Gavelhouse.com undertakes a homecoming of sorts. “Gavelhouse.com was actually Australian owned to begin with but it just operated as a listing-based website through which people would advertise their horses. It would be up to the buyer and seller to negotiate between themselves,” Andrew explains. In November, Gavelhouse.com returned to the Australian market to challenge two long-established auction houses (Magic Millions and Inglis) which run monthly, traditional sales. However, as in New Zealand it will target the mid-lower end of the market. Should the company stake its claim successfully in Australia, further markets could soon beckon, says Andrew. “The beauty of Gavelhouse.com is that we can take it anywhere in the world. We don’t want to run before we can walk but, once we’re happy with how things are going in Australia, we will look closely at other markets. The next one would possibly be South Africa; we think it could work well there. All too often in sport, it’s the flash Harrys who are best remembered. And yet, while he credits legendary thoroughbreds such as Phar Lap, Bonecrusher and even Seabiscuit, a dark horse shines above all others for New Zealand Bloodstock director (NZB), Andrew Seabrook. Born into a horse racing family in Karapiro (near Cambridge), Andrew has a life-long association with horses, although, he could be considered somewhat of a dark horse himself. Surprisingly, he doesn’t ride and initially pursued accountancy as his chosen field. “I rode a little bit when I was younger and I had a pony but I wasn’t really into it. I was really more interested in ball sports, particularly tennis. However, I definitely enjoyed a flutter on the horses, much to my parents’ distress! Despite studying accounting and finance at the University of Waikato, it was front line horse sense, rather than playing by the numbers, that Andrew’s first (and only) employer required. Today, this former Karapiro kid may hold the reins as NZB’s managing director, but as he is also a director of the Auckland Racing Club, Andrew is often found back at the track.